62 comfortable rooms, situated off Jalan Danau Pozo, the coolest tree-lined area of Sanur. All feature AC, Cable TV, Refrigerator, Minibar, Hot and Cold water, Coffee Maker, IDD Calls and free WiFi in the rooms. 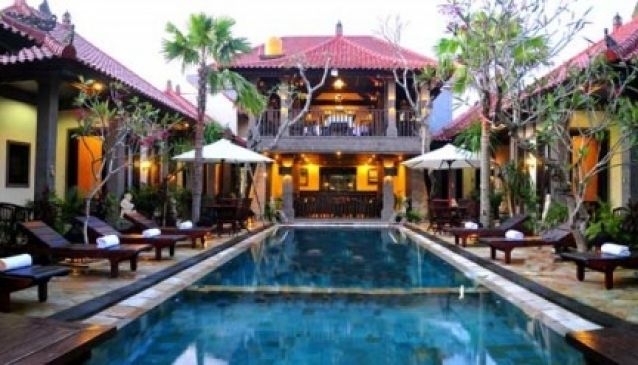 Villa Ganesha is the perfect retreat for a family or intimate group of friends. This tastefully decorated two bedrooms suite has been designed as a home environment, with private swimming pool, a small kitchenette and dining table the preparation of light refreshments. The 10 VIP Rooms are suite, each with private terrace and direct access to the swimming pool. 21 deluxe rooms located on the first and 2nd floor. 21 Superior Rooms located on the first and 2nd floor, each with balcony overlooking the garden. 10 Standard Rooms are with double or twin bed. Plenty of superb restaurants and beach within short walking distance. MEETING PACKAGES or Dinner Set for 10 - 60 persons in various rooms.